Calls for greater awareness may actually impede action. I will be the first to laud the political activism that has burgeoned on Dartmouth’s campus in the last few months. It is deeply gratifying both on a personal and philosophical level that our community is engaging with important issues, including injustice, prejudice and sexual assault. As a bisexual woman of color, these issues are deeply personal to me, and I appreciate that they are being discussed. However, I do not feel supported. 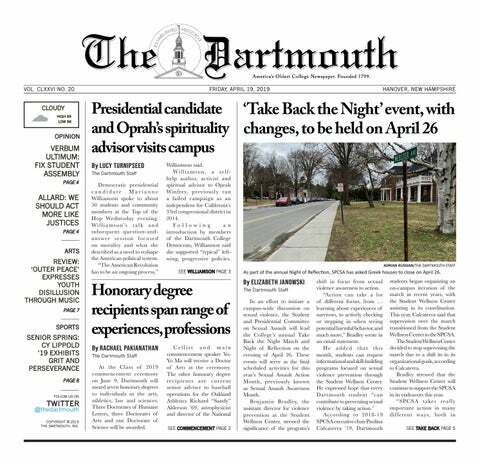 Activist groups at Dartmouth have repeatedly sent out “solidarity” emails calling on the student body to support those affected by the issue at hand, whether they are women (as in the case of Ryan Spector’s column “You’re Not Tripping” in The Dartmouth), sexual assault victims (as in this past Friday’s Night of Solidarity) or other marginalized groups. Greek houses, a capella groups and other campus organizations send emails to the campus listserv saying, “Hey! We care about this issue! We want to support the people affected by this issue!” How could they not? On this progressive and heavily politicized campus, is anyone going to say, or even imply through inactivity, that they do not care about sexual assault? Of course not. Add in the threat of ostracism and scapegoating, as well as the singling out of fraternities, social spaces or sports teams as “rapists” or “sexist,” and it is no wonder that support for sexual assault victims appears unanimous. This is virtue signaling at its finest. The fear of being labelled as “rapey” motivates organizations to public calls of action and loud displays of solidarity. The Interfraternity Council shut down all houses on Friday in support of the Night of Solidarity (as per their email on April 4th), but it is laughable to me to think that all fraternities, let alone all fraternity members or even a majority of them, genuinely care about this issue. In the echo chamber of each house, with members who believe they and their brothers are above wrongdoing, the fear of the administration cracking down on them at the first whiff of misconduct who desire to maintain a “good guy” reputation amongst women so that their basement will be the most popular, no brother would admit to assault. When everyone appears to be in public agreement, solidarity is not a message of support but a disguise behind which to hide. This campus must stop vilifying those who do not immediately speak out to support others — those for whom action has a personal, emotional, physical, social or academic cost. Upon seeing the call to support the Night of Solidarity, members of Greek houses advocated for immediate action because they were worried about emailing too late and looking like bandwagon-jumpers. As a memeber of Tabard, I feel that our space is the model for gender equality in the Greek system; we try to be very proactive about sexual assault on a daily basis. We should not feel pressured to publicly state support for specific issues on specific dates when sexual assault reform is already a part of our fundamental mission. I urge activists to stop using peer pressure and ostracism to further their goals, as it creates a poor incentive structure. It alienates those who best work toward the goal at hand, while providing an opportunity for others to effortlessly gain legitimacy and false virtue. This is the problem of self-selection. Those who are active supporters of victims of sexual assault will have meaningful conversations and continue their good work. Those who are not will send an email of support, after which they will either laud themselves on their virtues or continue to party. Creating an arbitrary event for awareness does nothing actionable; it merely creates an opportunity for apathetic or malicious organizations to publicly signal their virtue by stating their support. Cries of support do not create social change; empathy, acknowledgement and action do. Those who have been targets of sexual assault or violence need their peers to call out their brothers, sisters, friends, mentors and teachers when they blur the lines of consent. They need real understanding and an effort on behalf of their peers to teach others. But mass emails will not accomplish this. I sincerely hope I am wrong. I hope that the Night of Solidarity inspired fraternity members to keep an eye on their brothers. I hope that this Night of Solidarity gives victims the courage to report their assaults. I hope it sparks a change in the administration to crack down harder on sexual assault. As for me, all it has done is to make me scared to lend nuance to the dialogue, as I may be attacked, libeled and pressured into expressing my political opinions through the wrong means. It has made me scared to defend fraternities as regulated social spaces on campus that offer an alternative to unregulated off-campus houses. I feel forced to speak when I would be happy just to listen. It worries me deeply that “solidarity” seems to mean a defense of complacency, not action. I don’t think anything will change — but please, prove me wrong. Sankar is a member of the Class of 2019.